Thank you for your mail. I am sorry that computer problems at my end meant that I was not able to read it until yesterday. I was glad to hear that you have recently rejoined the Society after a long hiatus; I agree that our recent publication record is something to be proud of and a step in the right direction. You are right to remark that the NC is looking to the future of the FMJ - this is [part of] our job, after all - but I disagree with the implications you seem to draw from what you have heard. The discussion about an on line Folk Music Journal was in fact initiated by the editorial board. A well developed discussion paper was circulating within the board on this topic as early as October 2003. If we are to be taken seriously as an academic journal the principle is clear - abstracts must be available on line, and institutions are increasingly taking their subscriptions through the major electronic libraries. However, there is no agreement yet on the timetable for FMJ to move towards an online presence - and certainly no plan to do so without consultation with, or consideration for, the readership. To move to an exclusively online journal if the majority of its readers did not have access would be not only foolish but culpable. I have faith enough in both the editorial board and the National Council to believe they would not countenance such a move. Your suggestion that the move to an online (only) form would be cheaper is most likely true, but it probably would not save as much money as one might think. For instance, we would still want to 'typeset' the Journal for online publication, and there are additional costs to consider - how to ensure that an online Journal remains accessible for the next 100 years, for instance. If, however, savings were possible, I would not expect to reduce the Society membership fees as a result. Any savings would probably be spent on projects within the VWML (our other programme areas are generally self-funding) or on the longer term investments so necessary to ensure the Society, and hence the Journal, not only survives but flourishes. The National Council has a duty to ensure that the membership subscriptions are well spent, and if we can reduce costs whilst enhancing the delivery of our charitable objectives, we are, I think, honour bound to do so. To return to the recent NC discussion then: yes we discussed the FMJ; yes we are interested to know if savings can be achieved in this area, as in others. No, we are not interested in reducing the scope or distribution of the Journal. Yes, some NC members believe the future of journals such as the FMJ lies in exploiting online access and multi-media capability. No, the NC did not issue any mandate or instruction regarding future issues of FMJ. The NC tries to be concerned with policy and principle, not operational detail. The result of the discussion was that we asked Hazel Miller to continue working with the editor (David Atkinson) to see what mutually acceptable enhancements could be made. I should point out that Hazel has been in close contact with David ever since the latter's appointment and with Mike Heaney before that. Of course we would like to see cost savings - every organisation is always interested in cost savings - but not at the price of the Journal's integrity nor its accessibility. This NC recognises the importance of the FMJ and is keen to support its evolution in line with best practice in the field. Following Mike Yates' notice of the death of Cathie Stewart (of The Stewarts of Blairgowrie) on 16th January, I rang Sheila Stewart. Sheila confirmed that her sister Cathie had died on Saturday 15th January 2005 and the funeral, a small family event, was held on Thursday 20th January. Cathie had been ill for some years, so it was less of a shock to the family than it was to those of us who remember Cathie as a fine singer of songs like Hatton Woods, Virtue Rewarded and The Dawning of the Day. Sheila had seen Cathie on the Thursday before her death and had sung to her some of the songs she (Cathie) used to sing with father Alex on the 'goose' (the chanter of the pipes). Cathie had smiled in recognition of these but had been unable to speak. Cathie had her own repertoire of family songs which she used to sing with great style and relish. She will be sorely missed. It is not as widely known as it ought to be, but in recent years Andrew King has been doing much very valuable work at the British Library Sound Archive to acquire, organise and catalogue field recordings of English traditional songs, music, customs and other work from important collectors. He has known for some time that he is under the threat of redundancy and that the important work that he is doing is likely to come to an end. He has just heard that his appeal against redundancy is to be on the 11th of Jan. This was decided while he was away for the Holidays so it looks as though this was done very much to make it a fait accompli. There is not much time before then, but I feel that some sort of petition/protest ought to be arranged so that those in charge of making this decision will know that there are those who consider that Andrew's essential work ought to continue. You can email your feelings of support directly to Andrew at Andrew.King@bl.uk but it might be as well to copy emails to me at tinvic@globalnet.co.uk to co-ordinate. Spread the word to others who would want to support Andrew's work and get them to contact. If you are going to an event in the next few days, make a petition to be take along and gather signatures. We, the undersigned, feel that the vital work that Andrew King is doing in cataloguing and preserving English traditional culture at the British Library Sound Archive is too important for his contract to be terminated. We urge that he is allowed to continue this work until it is brought to a satisfactory conclusion. I would suggest an identical wording for any other petition sheets. Sections of C903 Reg Hall Archive. As well as these I have also been responsible for a considerable amount of work towards the re-cataloguing of the English Folk-Dance and Song Society section of C37, which consists of 106 pre Great War wax cylinders of traditional singers from the British Isles. In doing this I have been fortunate in having the help of Angus Nicol & Flora MacLeod on the Scottish Gaelic recordings, and John Bentley on the English ones. [These can be located on the catalogue by doing searches for: C37 AND EFDSS]. It should be noted that this is very much a work in progress, and many of the entries need substantial revision, especially as only a couple of months ago I had the great good fortune that Dr Cathlin Macaulay of the School of Scottish Studies was able to locate for me the Lucy Broadwood and Farquhar MacRae cylinder papers, notes which completely transform our knowledge of the Scottish Gaelic recordings. As a regular visitor to the site I know you appreciate the best in Irish sean-nós singing. Just thought you might like to know that on this coming Thursday evening at 8:00 pm there is an hour long radio programme on the life, etc, of Seosamh O' Heanai. The programme (which will probably be mostly, but not completely as Gaeilge) is broadcast on the RTE Channel - Radio na Gaeltachta. As far as I know this can be picked up on the Internet. I'm looking forward to listening to it. Keep up the great work. The site is always worth visiting and as I've told several people it's not afraid to criticise when it's thought warranted. This I think is a reflection that the site is a 'labour of love' and isn't dependent on advertising. It can't be easy to keep it going, but keep it up. Even those readers who never met Keith Summers will recall the grief which accompanied his untimely and tragic death earlier this year. Those who did know Keith will know that he was an assiduous record collector and that, in the course of a short but active life, he built up a large and aesthetically important collection. That collection has been lodged with me for safe keeping. In the course of moving the records from their old home in Southend to their new one on Merseyside, two crate loads of LPs went missing. The loss represents about 450 records, or roughly ten per cent of the entire collection. We cannot be sure what has happened to them, especially as the removal firm responsible is being totally obstructive and refusing any form of co-operation whatsoever. However, the most likely scenario is that they were stolen whilst in the company’s storage, and probably for sale to a record dealer. To exacerbate the problem, I cannot make this a police matter as long as the removal firm refuses to admit that a theft has taken place, or until I can come up with some independent verification of the same. The vast majority of the missing records are blues, and a list can be found HERE. I am appealing to anyone who buys or deals in second-hand LPs to keep an eye open for these records. Should you come across a similar list, I would be most obliged if you would e-mail me direct at Fredamhran@aol.com Please let me have all relevant details: where you saw the list or the records, and the name, address and phone number of the person who had them. In particular, if they turn up at a record fair, please also note the details of the seller’s stand, and of the fair’s proprietors. I cannot begin to explain how sickened I feel by this loss. However, I can explain that I am far less concerned with the monetary value of these records than I am at the fact that Keith’s collection has been desecrated, and that its integrity can no longer be preserved. It was a register of his life’s work and interests; it contained many rare, important and irreplaceable items; and it would have been a first class guide for anyone from a future generation, who wanted to know what we meant by the term traditional music. "This would have been Bob's 90th birthday party and, for this year only, the celebrations will be held in his absence. This will be a celebration of his life in song and images - film, video, photos, articles, stories, anecdotes about the man." There will also be the Bob Copper Memorial Concert: the EFDSS are to host a celebration of the life and music of Bob Copper on Saturday 2nd April 2005 at Cecil Sharp House in London featuring the Copper Family and many guests. Beginning around midday, the afternoon session will include a singaround, an audio-visual presentation about Bob, and a concert. An evening concert will feature the Copper Family and special guests. The recent BBC4 television programme might have been regarded as the definitive film on Bob's life but, as Jon says, we are seeking material that might be included in these two occasions. Suggestions and contributions to me at folk@brighton.co.uk in the first instance. When I first heard the Maurice McSweeney's Stars of Munster recordings, it struck me that the style was too modern and the recording ambiance was nothing like a 78rpm disc. My intelligence sources close to the ground suggest the fiddle player is Sean Casey and the location The Stag's Head in London! I've never pursued it further. And, as I'm sure many readers will know, Ron Kavana played in sessions at The Stag's Head for many years! - Ed. Recently, fRoots magazine sent me a review copy of Irish in America, a French compilation of traditional music 78s. A noted music collector was able to answer my queries regarding one musician whose name I had not encountered before and, in the process, alerted me to a possible hoax which may be of interest to the readers of Musical Traditions. Back in 1999, Proper Records issued a four-CD boxed set of 78s, compiled by Ron Kavana and entitled Farewell to Ireland. Two tracks on the third disc are credited to Maurice McSweeney's Stars of Munster, a group whose existence does not appear to be verifiable by any recognized sources. Here is the biography of Maurice McSweeney, as set down on page 26 of the Farewell to Ireland liner booklet. Born in 1895 at Kilworth near Fermoy, Co Cork into a family of musicians who worked as salmon gillies on the River Blackwater, Maurice had mastered the melodeon and two-row button accordion by his teens. He married a concertina player Bridget Della Kelly from Galbally, Co. Tipperary. They emigrated to Chicago in the 20s where Maurice ran a successful tea store. He played dances and broadcast regularly with two line-ups: The Blackwater Boys (a quartet) and the Stars of Munster (a dancehall band including piano and drums which varied in size between six and eight pieces). Following the example of Tom Ennis, he made and marketed his own recordings on his independent Avondhu label which he then sold through his tea store. In the early 1930s he was forced to move to Tucson, Arizona for health reasons and died there in 1936. Following his burial in Chicago, his wife and three children returned to Ireland where she ran a pub which was known as a great music house, but she never played the concertina again after his death. To bolster this account a photograph of McSweeny [sic] and his daughter Dolores has been provided, while the liner insert for CD 3 in the boxed set features another picture showing Maurice on the right playing an instrument of a suitable vintage. However, while Ron Kavana's biography of McSweeney seems plausible enough on the surface, it does include a number of oddities. Firstly, there is a place called Kilworth and it is near the Blackwater River which is renowned for its fishing opportunities, as Ron Kavana well knows since he actually comes from Fermoy! However, Galbally is in County Limerick, not Tipperary, and there is something rather odd about his wife's middle name - Della is decidedly un-Irish. McSweeney itself is a name found in Cork, of course, though the most well known musical bearer of that appellation would be Torlogh McSweeney (Tarlac Mac Suibhne), known as An Píobaire Mór, from Donegal (and the McSweeney clan were originally gallowglasses from The Hebrides). I have not yet been able to verify whether anyone really ran 'a successful tea store' in Chicago, but there is something slightly strange about the name which Maurice chose for his label, Avondhu. This is a corruption of the Irish which means 'black river' which takes us neatly back to the Blackwater again. While Tucson's mild winters do attract many senior citizens to the area, it is hard to imagine that the baking hot summers would lead to anybody moving there on health grounds (though I could well be wrong, but McSweeney supposedly moved there long before the days of efficient air conditioning systems). More relevantly, perhaps, readers of the liner will note that the identity of that 'great music house' run by the widowed Bridget Della McSweeney on her return to Ireland has not been revealed; a surprising lapse. However, take a very close look at the picture of the band (right). The accordionist is not the same person as the man leaning against the car (the hair, nose shape and physique are markedly different). I would suggest that the first photograph is real (though the actual identity of its subjects is open to question) and that the second has been deliberately staged. Indeed, there is also something rather peculiar about the fiddler's head which appears not to belong to his body; note the rather different hair colouring at the top. If this is beginning to all seem a little fishy, well, take a listen to those two tracks featuring the Stars of Munster: Bank of Ireland / Wind That Shakes the Barley; and, Martin Wynne's / Craig's Pipes. On first hearing they do seem authentic, but then it begins to dawn that they really do not sound like 78s, even if someone has thoughtfully added a touch of pop and crackle to the mix. The real telling point is revealed by Craig's Pipes (sometimes known as Cregg's Pipes), when the drummer breaks into a few rock riffs. But hang on a minute, what about Martin Wynne's? McSweeney's 'biography' implies that these recordings were made at the very latest in the early 1930s, by which time the actual Martin Wynne (born in 1916) would have been in his mid-teens. Wynne departed from Sligo for England in 1937 and his entry in The Companion to Irish Music tells us that he composed the three reels bearing his name in the 1930s before he left home. It is hardly likely that any of these were known in Chicago in the early years of that decade and doubtful whether those reels would gain any currency in the USA until Martin arrived there in 1948. Indeed, according to the expert I mentioned at the beginning of this letter, the first ever recording of one of those three Martin Wynne-written reels was made by Paddy Killoran in 1950. By the way, I can find no other recording where Martin Wynne's and Craig's Pipes are played together as a set, but the only album I have discovered where both tunes appear is The Bothy Band's debut, which was not released until 1975 - and which would be very familiar to the compiler of Farewell to Ireland. Obviously, the most successful hoaxes have never been discovered. I know that there have been a number of very dodgy blues releases over the years, but I cannot recollect anything similar occurring during the history of Irish traditional music recordings, nor one which, superficially, seemed so plausible. So what were the perpetrators' motives? There are two possibilities. The first is that Ron Kavana and his mates were simply having a bit of fun in the same way that Eric Idle's Rutles aped The Beatles and Spinal Tap savaged every pompous heavy metal band. However, the second is slightly more far-reaching and suggests that Ron was cocking a snook at collectors of 78s by sending them on a wild goose chase. I do not know the actual answer as all my attempts to track down Ron have failed and Proper Records has not responded to my enquiry. Whatever the case, the fact that one of those faked tracks has turned up on another collection (and one published by an estimable French label) means that the hoax has been far more successful than its instigators might have ever expected. Moreover, the compiler of the liner notes to Frémeaux's Irish in America, one Gérard Herzhaft, has actually added to McSweeney's 'biography', informing us that his wife often played with the non-existent Maurice on the radio and in dancehalls and that she was an accordionist. The translator goes even further and informs us that McSweeney 'recorded in quantity for his own label'! 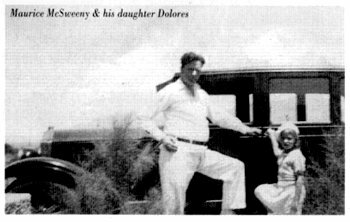 All that's now required to cement the myth is a published interview with Dolores McSweeney (the girl depicted in the first photograph above) or for some elderly denizen of Tucson to step forward and recall the great evenings spent dancing to Maurice's accordion. I might be wrong, but somehow I don't think either event is likely to happen. My name is Bob Spence. A friend just told me on the phone that a researcher into traditional American music who lives in Great Britian is looking for information about Frank Hutchison, who was a "mountain blues" guitar player in my home, Logan County, West Virginia, in the 1920s. I am trying to find that person, and help him if I can. I have a photograph of Frank Hutchison, which I understand the researcher is looking to find. I wanted to write to thank Chris Smith for taking the time and effort to review our new (and first) CD The Ozark Sheiks. We really appreciated the description and characterization of our music, and in many respects feel that Mr Smith hit the nail on the head, in terms of how we hope that folks will respond to our stuff. However, I believe there was some misunderstanding of our biog/written material, that unfortunately resulted in Mr Smith misrepresenting and unjustly portraying our thoughts and inspirations regarding the music. If his criticism had been limited to the music, I would under no circumstances take up your time with a letter, but because of the issues at hand, I feel it necessary to make a plea for reconsideration. Please Mr Smith, we implore you, re-read our biog (which may be viewed at www.possumcarvers.com). We only referred to the lack of documentation of certain musical styles due to the record companies, and this does not negate (or even address) the rampant racism of the times. I don't see how you could characterize us as '... doing what American television does ... airbrushing reality', because we simply do not! I would like to add that, unlike many writers, researchers, and purveyors of roots/oldtime/americana/etc., from the folk movement of the 1950s and 60s to the present time, both Blaine and myself were raised in the deep south (and I might add, in relatively socially aware families). This has sometimes been a strength, because from day one we've been immersed in the culture, landscape and vernacular that birthed the music. At the same time, we've been painfully aware of the sad state of race relations that not only is part of the history of the music, but that persists today. We would never try to down-play this fact, and this is indeed part of the reason we're interested in highlighting historical exchanges between African-American and white musicians. Mr Smith also seems to misunderstand what we mean when we talk about playing the music in the spirit of the originators, and wonders how we could do such a thing without '... access to a time machine.' When we say we want to play this music the way it was PLAYED rather than how it was recorded, we're talking about going about it with the abandon and intensity that is evident in best of the early recordings, as opposed to the revivalist tendency to painfully replicate every detail of a specific recording. In fact, Mr Smith states in his review 'The great thing about UCCPC, though, is that none of their versions attempts musical mimicry ... without betraying the spirit of the originals. We couldn't have said it better ourselves. At any rate, we're really just begging Mr Smith to take another look at our stuff, and if he finds it appropriate, to perhaps amend his review (or at least make an addition). I simply don't feel that our thoughts behind the music were fairly portrayed. If after another reading Mr Smith still finds '... the intellectual basis of UCCPC's music is flawed ...' I would simply make the request that he writes to us and explains how we might edit our biog appropriately. We simply cannot stomach the thought of this aspect of our approach to music being misunderstood. And one last thing, regarding our 'irritatingly whimsical' bandname ... what about Pigmeat Pete and Catjuice Charlie, Seven Foot Dilly and His Dill Pickles, The Mississippi Possum Hunters, The Wampus Cats, The Fruitjar Drinkers, and of course our fellow Ozarkers Dr Smith's Champion Horse Hair Pullers? We ain't gonna' apologize for our name. After all is said and done, we're Uncle Cuckleburr's Champion Possum Carvers, and we came to shake 'em on down.